Messianic Judaism is a movement that seeks to break down barriers and rebuild bridges: between Jews and the One who fulfilled so many Messianic promises, between Jews and Christians, between a Jewish and non-Jewish spouse, between the generations…. Yeshua sent his disciples out with a message of Good News, first to Jerusalem and Judea, then to Samaria (never mind that for centuries Jews and Samaritans had despised each other and worshipped on different mounts), and then to all the nations of the earth (even though they were mostly idol-worshippers). Yeshua prayed that all his followers would be one, just as he and our Father in heaven are one. Jewish apostles went to cities all over the Roman empire, always going first to the local synagogue. There other Jews agreed that Yeshua really was like Isaac bound by his father, like Joseph betrayed by his brothers, like the lamb whose blood made death pass over, and fulfilled the prophecies of Messiah the would suffer and be cut off (Isaiah 42:1-4, 52:13-53, Psalms 22, 41:10(11), 69:2(21), Zechariah 12:10, Daniel 9:25-26, etc.). Gentile women and men also came to love this Messiah who removed the barrier of sin and just punishment between them and the one true God and Father who would welcome them into His family forever. Yet alas, many Jews rejected this message of reconciliation, and then many Gentiles rejected Jews. After a few centuries, Christianity came to define itself as not Jewish and Judaism came to define itself as not Christian. Christians were forbidden to enter synagogues, let alone attend Passover Seders or marry Jews. 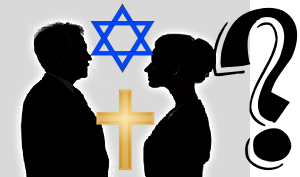 Jews thought of churches as pagan and shunned any of their children marrying non-Jews. Eventually, so-called Christians called Jews “Christ-killers” and shut Jews up in ghettos—the walls of false, hostile thinking even became walls of stone! So again, we see Messianic Judaism as a movement that breaks down barriers and rebuilds bridges. Beit Simcha is a community welcoming Jews and Gentiles. We want to remove barriers that have kept Jews from studying our own Scriptures and considering the Messianic claims of Yeshua for themselves. We want to remove barriers that have kept non-Jews from experiencing biblical faith in a Jewish Messiah. Many of us come from families of mixed marriages—yet instead of assimilation or confusion, we affirm each person’s unique identity in unity with the Messiah of Israel. 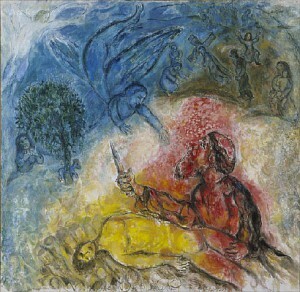 We observe Shabbat (Sabbath) in a way that Jews all over the world could recognize—saying the Shema, the Amidah, and other Hebrew prayers that go back to the days of Yeshua and the Temple, chanting from Torah scrolls, reflecting about what the Scriptures mean to us today, and then enjoying a good oneg (meaning delight but in practice good food and fellowship). Indeed, we delight in Shabbat, with songs both traditional and contemporary, with musical instruments and circle dances—just like King David said we should in the Psalms, so that everyone can enjoy the nearness of the Ruach Kodesh (Holy Spirit). We pray for the sick and see many healed. After oneg, some stick around for classes to learn more—so we can appreciate the Hebrew prayers, learn the Israeli-style dances, study Torah, and appreciate the convictions that we share as followers of Messiah Yeshua. Our children learn to love the God of Israel in nursery (from the beginning of services) and Shabbat school (starting about halfway through services). We are happy to say that after a bar/bat mitzvah, our young people remain consistently committed to our congregational family. Then we gather in havurah (friendship) groups for fellowship in homes all over the region. Come, taste and see how good our God can be! 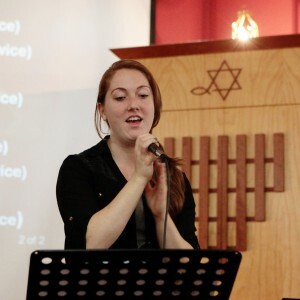 Come to one of our Shabbat services, spring, fall or other festivals, or musical coffeehouses. Check out our Rabbi’s sermons or arrange to meet with him over coffee or a Shabbat dinner. 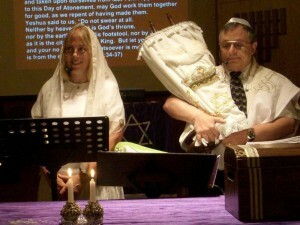 Beit Simcha is affiliated with and accountable to the Tikkun America network (see also Tikkun Global Messianic Family) as well as the International Alliance of Messianic Congregations and Synagogues (IAMCS), from which Rabbi Blank received his s’micha (ordination).